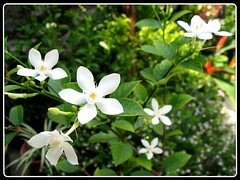 Plant type: A perennial ornamental small tree or shrub, native to Sri Lanka. Light: Prefers bright light or full sun; Can tolerate partial shade but will result in less flowers. Moisture: Regular watering and moderately. Propagation: By stem cuttings. (I’ve tried stem cuttings without success. However, Rand in his comments below and here have shown this method is possible with patience). Marcotting or air layering may be the other alternative method of propagation, especially for difficult-to-root stem. Features: Wrightia antidysenterica is a small and compact semi-deciduous shrub, reaching 1.2-2 meters in height, with a spread of about 1.5 meter. A moderate grower with several short and divaricate branches that turn chocolaty brown as it ages, and adorned with dark green, ovate and acuminate leaves (2.5-6cm long) that are oppositely arranged. 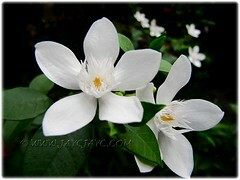 And, pure white tubular 5-petaled flowers with yellow centers appear in corymb-like cymes at the end of branches. The Snowflake or Milky Way as commonly known, is a beautiful shrub that will be studded with showy 2.5-3.5cm star-shaped flowers all year round. There is a related species, Wrightia tinctoria, whose blooms look quite identical. 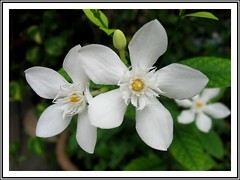 Usage: Wrightia antidysenterica will be most ideal as a container specimen for patio or houseplant. Excellent too for planting on ground in limited garden space and will brighten any garden corner with those starry white blooms that resemble snow flakes or little stars from afar. Besides, in India, it is considered a medicinal plant. The bark has anti-microbial and anti-inflammatory properties, and is used as an adulterant for the well known drug, Holarrhena antidysenterica. The juice from its bark is used for the relief of mouth sores and its leaves are used for the treatment of several skin disorders, psoriasis and other non-specific dermatitis. Care: Wrightia antidysenterica is quite a low maintenance plant. As long as it receives sufficient bright light or sunshine, regular watering and occasional fertilizing, it will reward you with profuse blooming and luscious green foliage. Requires minimal pruning and it is least bothered by pests and diseases! i just love these plants.my only problem is propigating them.i tried cuttings,layering.not one took.any suggestions? please can any-one tell me whats wrong with my wrightia’s as I’m on the east coast inland abit of queensland australia and have 2 plants that seemed to be doing well but now it’s bare and not looking very happy no flowers not even a leaf on either plants and they get all morning sun please any help would be grateful.thanks. I got this plant couple months ago at my local Urban Garden Center for cheap! It was $8 dollars, and the retail price in one of the store I know sells it for $25. The owner, or manager, of that store told me it is rare to find in the area where I live. I love my Urban Garden Center! Yesterday, I finally have time to try to propagate this plant. So using a mixture of peat moss and perlite, I have cut stems from the slightly leggy plant that I have, dusted it with root hormone, and planted it on 3-4 inches pot. I then cut the bottom of the bottled water, put a hole on the cap, and used this material to make sure the cuttings are always humid. I placed the pot in a bright, filtered sunlight, area. I’m crossing my finger that it roots! It so unfortunate that the pretty flowers don’t have any scent. But it does make up for the continuous show of flowers. Hope your cuttings are successfully rooted, Rand! Keep us updated, please. Thanks. The plants I propagated is growing new shoot of leaves!! This plant took so long to show signs that it is going to survive. I have to take the cap of off the bottle because it was too humid and have to spray a small amount of bleach with water solution to the cuttings to remove the sign of mold. Then the waiting almost killed all the cuttings; I got impatient and got curious a month later–so I took out the soil in one of the pot to see if the cuttings has roots, it didn’t have any, but the leaves remained green. So I continue to water it occasionally and just wait. I had three cuttings per pot, and I had three pots, but I lost two cuttings because I got impatience, the two died probably because of my curiosity; the disturbance in the soil probably killed the two cuttings. So months later, almost all the cuttings sprouted new leaves. One cutting still didn’t sprout new leaves. Once all the new leaves has fully grown, and if I see signs of roots on the bottom of the pot, I’ll acclimate the plants, then I will separate the cuttings into their own individual pots. Hi Rand! We truly appreciate you taking the trouble to share your experience on propagating this lovely plant by stem cuttings. Thank you so much… we’re definitely enlightened by your tips. May your plants continue to flourish well and delight you further. Congrats on your success and thanks for sharing, Rand! Hi, I’ve acquired my snowflake just yesterday on my mother’s in law. what I’ve done is through stem cutting. what I did is removing first the 1st layer of skin of their stem at least 3 inches on the end part before i planted them on the ground. in this case, the roots will come up faster. Does anybody done this before on this kind of plant? Is this method alright? hope to hear from you guys soon.. Here in Thailand I have propagated these plants simply by taking a woody cutting and sticking it into the ground.